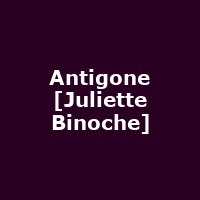 "Celebrated stage and screen actress Juliette Binoche plays Antigone in a contemporary version of Sophokles's tragedy, translated afresh by TS Eliot Prize-winning poet Anne Carson. When her dead brother is decreed a traitor, his body left unburied beyond the city walls, Antigone refuses to accept this most severe of punishments. Defying her uncle who governs, she dares to say 'No'. Forging ahead with a funeral alone, she places personal allegiance before politics, a tenacious act that will trigger a cycle of destruction. Renowned for the revelatory nature of his work, Ivo van Hove first enthralled London audiences with his ground-breaking Roman Tragedies seen at the Barbican in 2009."